Demonstrators hold banners during a protest rally opposing the appointment of Communist member of parliament Zdenek Ondracek to chair a committee that oversees Czech police inspection in Prague, Czech Republic, March 5, 2018. The banner reads: "Not this way. No!" A Czech Communist lawmaker resigned Tuesday as chair of a parliamentary commission overseeing police internal affairs, after thousands protested the appointment because of his past in a communist-era special unit. Zdenek Ondracek was narrowly elected by the lower house of parliament last Friday to head the commission — the first Communist lawmaker to hold such a post since the fall of communism nearly three decades ago. 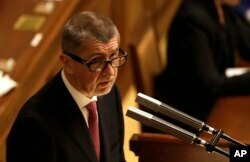 The appointment was considered a signal the party was gaining influence as Czech Prime Minister Andrej Babis' ANO party sought its support for a new government. Thousands of Czechs protested in Prague and other cities against Ondracek's appointment Monday evening and also against Babis, who had said over the weekend he would support Ondracek's recall from the committee. FILE - Czech Republic's Prime Minister Andrej Babis addresses lawmakers during a Parliament session in Prague, Czech Republic, Jan. 10, 2018. On Tuesday, Ondracek announced his resignation in parliament. "I am not leaving this post because of a couple of loudmouths in the street, but because I have assessed the security situation of myself and my family," he said, mentioning unspecified threats against his family. Many lawmakers opposed Ondracek, who was part of a police unit that used water cannon, clubs and dogs to disperse anti-regime protests in 1989. Those demonstrations eventually led to the peaceful overthrow of the Communist dictatorship in what became known as the Velvet Revolution. The Communist party, which opposes NATO membership and holds pro-Russian views, has held out chances of support for Babis, whose minority cabinet lost a confidence vote in January even though ANO handily won an October election. Other parties have mostly shunned Babis, who faces police charges of illegally obtaining European Union funds worth 2 million euros ($2.48 million) a decade ago. He denies wrongdoing. His ANO party is chiefly negotiating with the Social Democrats whose chairman, Jan Hamacek, had said the party could join an ANO-led government but Babis' presence remained a problem. Direct or indirect support might also come from the far-right, anti-EU SPD party of Czech-Japanese businessman Tomio Okamura — which has also raised concern among opposition parties and from some in ANO.